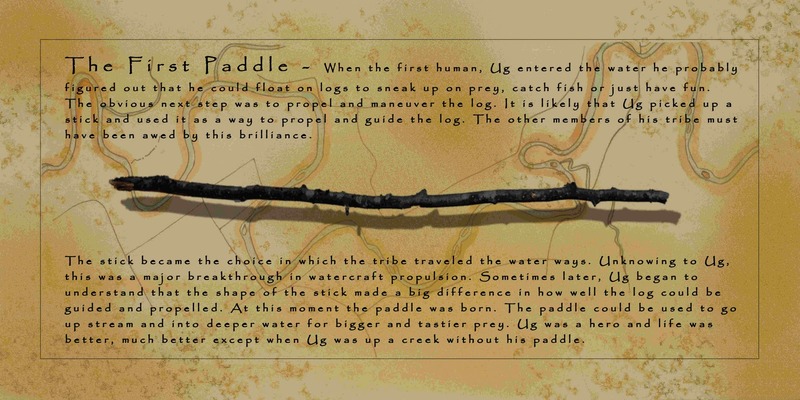 THE FIRST PADDLE - When the first human, “Ug” entered the water he probably figured out that he could float on logs to sneak up on prey, catch fish or just have fun. The obvious next step was to propel and maneuver the log. "Ug" picked up a stick and used it as a way to propel and guide the log. The other members of the tribe must have been awed by this brilliance. The stick became the choice in which the tribe traveled the water ways. Unknowing to "Ug", this was a major breakthrough in watercraft propulsion. Sometime later, "Ug" began to understand that the shape of the stick made a big difference in how well the log could be guided and propelled. At this moment the paddle was born. The paddle could be used to go up stream and into deeper water. Ug was a hero and life was better, much better except when "Ug" was up a creek without his paddle. PADDLES HAVE come a long way! It just so happens that my fishing buddy just bought a new Bending Branches Navigator Wooden Paddle. A fine paddle that is absolutely beautiful and light as a feather. I don't normally talk about products on this web site, but this is a must see. GET AWAY from the big stream and get on a big stream! "Ug" must have been a very talented man. You ever try sitting on a log in the water? Ain't easy. As a kid I almost drown floating a log.